Steve is one of two churchwardens at St Nicholas. 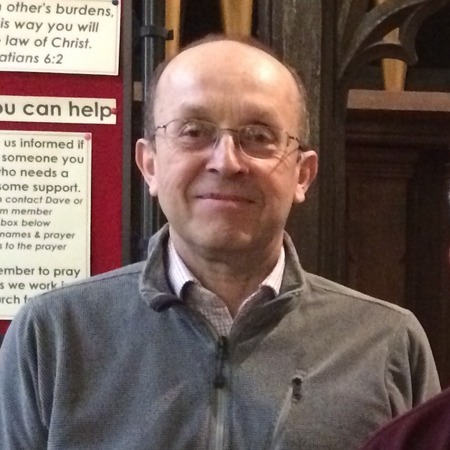 Steve was elected as a churchwarden in 2012. His main areas of responsibility for the PCC centre around maintaining the fabric of the church. In his professional life, Steve works for Airbus Defence and Space Ltd in Stevenage, where he is involved in the design of mechanisms for use on satellites. Outside work, Steve is a sometime musician and regularly sings and leads the church music group. He also enjoys cycling, going on at least one leisurely tour each year, mostly in the UK but occasionally abroad, recently cycling to Hull on a Brompton folding bike. With a growing belief in the philosophy of slow holidays he has recently renewed an interest in low powered motorized two wheel transport.